Ra Ra Riot were formed in Syracuse, NY, so I always feel a sense of hometown pride when I hear them mentioned (even though I’m not from Syracuse and most people from Syracuse probably have never heard of the town where I grew up or the town where I now live). Nonetheless, their ascent to the indie rock royalty throne is certainly a story that will inspire kids from these parts for years to come. You could even call them a comeback story. At any rate, this band is a major player in the indie scene and beyond – but we’re all wondering, can they repeat the success of their debut, The Rhumb Line? The initial response to that question comes in the form of Boy, a quaint EP of three songs that clocks in at just over 10 and a half minutes long. The first song, the title track, is the only one that will also make an appearance on The Orchard, RRR’s sophomore album that is scheduled to be released on August 24.”Boy” is also the best track on here; hopefully, it is an indication of what the full-length album will be like. It’s got great drums and an upbeat tempo. Our favorite string instruments give the song texture that most bands could only dream of. Love the bubbling bassline and that quickie guitar solo. Fantastic. 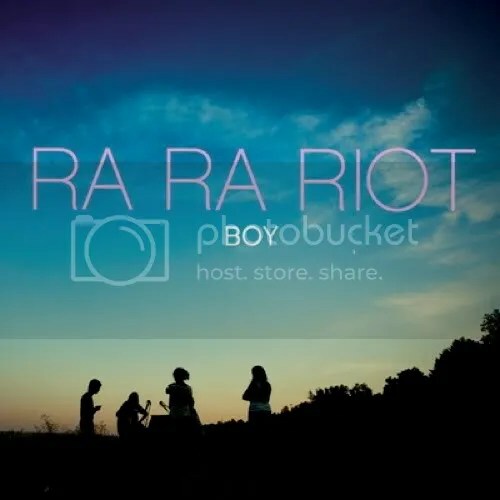 The other two songs on this (“Saccharin and the War” and “Keep It Quite (Bear)”) didn’t strike me as immediately as “Boy” did and while they would be at the top of the output heap for many other bands, I know Ra Ra Riot can do better. These songs are “growers” and maybe I’m just being too judgmental – I didn’t have to wait for “Ghost Under Rocks” or “Dying is Fine” to grow on me since I was instantly attracted to them! I am enjoying these other two the more I listen, but still. I have very high standards here and hope for more instant attraction with the rest of the new material. Definitely looking forward to The Orchard based off the strength of “Boy”. August 24, here we come. This entry was posted on July 22, 2010 at 12:00 pm and filed under TheSlacker. You can follow any responses to this entry through the RSS feed.